One of the largest, and most important organs is your dog’s liver. It has a number of functions, such as in digestion, detoxification, sugar storage, breaking down red blood cells, and hormone production. It is found under the rib cage, encircling the stomach, and tucked up next to the diaphragm. In this article you will learn the more common causes of canine liver disease, along with the common symptoms to recognize in your dog. I will discuss the more steps in diagnosis of liver disease, and the large number of holistic options available if your dog is to be diagnosed with canine liver disease. There are numerous things that can cause liver disease ranging from tumors to infections. Dogs commonly eat compost in which there is often a toxin that can cause acute liver disease. Your pet can get a viral infection affecting the liver (hepatitis). Young dogs can have liver disease as a result of a liver shunt, or certain breeds can aquire liver disease due to a copper storage deficiency ( Bedlington Terriers, Westies, Keeshounds, Dalmations). Common veterinary medications ( Non Steroidal Anti-inflammatories) can damage the liver and result in signs of liver disease. Fortunately the liver can do a wonderful job of regenerating liver cells, and can heal itself with supportive care and supplements. The signs of liver disease are many and varied; they are similar to many other canine diseases. In the early stages there are often no symptoms, and the first signs can be very non specific. Some of the more common signs start with eating; your pet’s appetite is lowered. Some dog’s are depressed, are lethargic, and classified as ADR (ain’t doing right. As the disease progresses, there may be vomiting or diarrhea. Many dogs show signs of increased drinking and urinating more than normal. Due to the lower protein levels in the blood (low albumin which is produced from the liver), you may see fluid retention which will show up as a swollen belly. A classic symptom is jaundice; the white area around her eyes and the gums may be yellowish. A few uncommon signs include neurologic disease (ie circling, head pressing, ataxia, seizures), and hepatocutaneous syndrome (skin disease), which shows as thickened crusted foot pads, itchiness, redness between toes. Canine liver disease is diagnosed with an initial physical exam, along with a detailed history which may reveal some of the classic symptoms, such as jaundice. Your veterinarian will suggest a basic blood panel; this may reveal many changes suggesting liver disease. You can see elevated ALP, ALT, GGT and bilirubin. Many dogs are anemic (low RBC’s), and most have low protein levels, especially low albumin, which is produced by the liver. 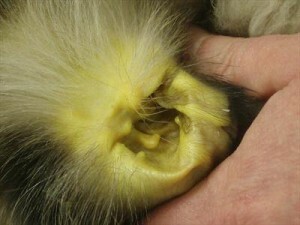 Urine changes often show bilirubin, and brownish/yellowish urine. If you suspect that your dog has liver disease, the first step is to confirm what type of liver disease your pet has. Your vet can perform some of the above specific diagnostic tests as there are so many possibilities. Adequate nutrition is needed to help the liver heal. Offer him his favorite food. In some cases, spicing it up with garlic and warming it in a microwave will encourage eating. Many holistic veterinarians advise a natural, moderate protein, moderate carbohydrate diet; your veterinarian may advise a specific veterinary diet. Regardless the most important thing is it being a food that your dog likes, and wants to eat. The composition of the food is now near as critical as getting him to eat. Of all the alternative options, milk thistle is the most important solution in helping any ailing liver. The active ingredient is silymarin and it has protective effects on the liver, improve liver function, helps treat liver inflammation, toxin induced liver disease, and end stage liver failure (cirrhosis). The dose of the dried herb is 100 mg per 10 lbs of body weight daily. It is available at most pharmacies. I have had great success using this herb. S-adenosylmethionine (SAMe) is a supplement and potent antioxidant shown to be very effective in people and pets with chronic liver disease. The tablets are available at health food stores; give 800 mg per 40 lbs of body weight daily. Antioxidant vitamins work in conjunction with SAMe to decrease liver cell damage and help the liver regenerate; Vitamin E and Vitamin C are the two most commonly used. Give 400 IU per 40 lbs of body weight daily of Vitamin E, and give 250 mg per 40 lbs of body weight daily of Vitamin C.
Turmeric gives curry its flavor and yellow color, and has been used as an anti-inflammatory, to treat digestive and liver problems, skin diseases, and wounds while also being a powerful antioxidant. Antioxidants can fight free radicals and may reduce or even help prevent some of the damage they cause.. The dose of the dried herb is 100 mg per 10 lbs of body weight daily. It can also be given as a tincture of 2 drops per 10lbs twice daily. Many cases of liver disease are believed to be secondary to the immune system attacking the liver and bile ducts ( auto-immune). There are a number of supplements which can be helpful in normalizing the immune system, but there are particular ones that may be beneficial for the liver. Those are flavanoids, compounds in a class of their own. They compose the thousands of structures that give the bright color to fruits and vegetables. These include flavones, (apigenin), isoflavones (genistein), and flavonols (quercetin). Purchase a mixed bioflavonoid product that contains polyphenols, particularly EGCG (epigallocatechin-gallate), which is the specific flavonoid isolated from green tea. The dose for a 10 lb dog is 250 mg daily. 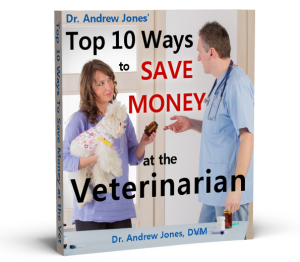 Homeopathic remedies are used to supplement veterinary care and additional remedies. These pets are often very weak, so I begin with lower potency remedies. Cardus Marianus is produced from Milk Thistle. Some dogs vomit the milk thistle herbal capsules, so this is the option to give. The dose being 1 30C capsule per 20lbs twice daily. Liver disease in dogs is one of the more common veterinary diagnoses, and you should now be able to recognize the more common symptoms (anorexia, weight loss, vomiting, distended abdomen, jaundice). The causes are varied, with many dogs having acute damage by ingesting some type of toxin, or reacting to a prescribed veterinary medication. There are numerous holistic options to treat canine liver disease, ranging from the herb milk thistle, to flavanoids including green tea. I have had success with a product called Marin and a home cooked diet. thank you for the information and a greater understanding of the problem,I enjoy reading all Dr. Jones material and have learned a great deal. Excellent article and advice. I agree with all of it and indeed have had several occasions to test these herbs on my dogs. when our 9.5 year old great dane started fitting I thought she was having a heart attack, but luckily the symptoms of the fitting was caused by a liver complaint. We’ve learnt a lot and and totally concur with Andrew about abstaining from feeding complete dried dog foods. I now prepare Dreama’s food every couple of days which consists of wholemeal pasta, wholemeal rice, potato, porridge, lots of fresh veg, fish chicken and lots of white meat as opposed to red meat which is harder to digest. Milk Thistle from the vet was really expensive so i sourced my local horse supplier who sells it loose leaf in 500G tubs. I add 2 scoops and incorporated stinging nettles very high in Vitamins, zinc, potassium and nitrogen. Also she has some dock weed, chickweed, dandy lion and rapeseed leaves and cabbage and lots of green veg. clover leaves are excellent. It’s amazin how your garden is abundant in natural food stuffs provided you don’t administer weed killers. We also went to out local gym and acquired big tubs of glutamin, creatin as they boast the immune system also things like amino acids that can be purchased in much larger quantities rather then the cost of the local health food shop. The proof of the pudding has to be our old lady who now runs around the garden like a puppy. Dreama is still of etherine for her seizures but fortunately she has not had a fit for 3 months. Being a great dane weighing in at 60KG she was started of on 4tabs 60mg a day, but over a period of time have cut her down to 3/4 in the morning and 1.5 tabs at night. Etherin can effect the liver and mindful to keep the dogs diet free from processed food, Etherin does increase the appetite and Dreama now eats four meals a day but part of her meal at lunch time is buttered bread soaked in pro biotic yogurt, which again is good for the digestive tract and liver, As a household as well as the dog we’ve switched to bottle water and have noticed the difference and not got that horrible chloride taste and hopefully see natural spring water as cleansing. We also add powdered ginger and garlic which is an anti- inflammatory. We’ve been back to the vets for blood tests, who’s very impressed at the recovery of Dreama considering 3 months a go she was at deaths door. I would like to hear your comments on the fact that our pets are being symptomatically poisoned by flea collars, flea sprays, flea drops, flea & wormer shots and heart worm meds which all contain toxic pesticides that damage the liver. Many of these products are used improperly and many at the same time. Thanks for your informative newsletters. I had written you on Chauncy’s liver count of 508 and asked what else I could do beside give him the Denamarin which he has been on. You suggested 500 mg Milk thistle added to his Denamarin. I am sending you smiles and hugs as in just TWO weeks his ALT went from 508 to 108, the lowest it has every been. The vet’s assistant could not believe it as he stated the Denamarin would not of done that on its own. I told him about you and how you are so amazing, the knowledge you have is a gift that I feel fortunate to have. I also have your ultimate canine health formula on auto ship for Chauncy which is giving me amazing results. I trust your suggestions and believe you are a man whom actually cares about on furry kids. My question is do I still give him the Milk Thistle along with his Denamarin. I have sent you a private e-mail on this question but just wanted to let people know you are the greatest vet ever and wish I could find someone like you in Florida. In response to Josephine Testa wanting a holistic vet in Florida, we use Dr. Tiffany Rimar I St. PETE BEACH,FLORIDA. In response to Josephine Testa wanting a holistic vet in Florida, we use Dr. Tiffany Rimar I St. PETE BEACH,FLORIDA. Her phone number is 727-360-5700 at 431 Corey Avenue. St. Pete Beach, Florida 33706. Why would spicing my dogs good with garlic be good? Garlic is poisonous for dogs.